Guilty pleasure admission: I've recently been listening to British pop music. Don't worry, SoundRoots isn't about to go all mainstream culture on you. In fact, this pop music does have discernible global roots, so it's not entirely off our usual track. Ironically for a band called The Worm, this group has a firm pop backbone that's often mixed with west African rhythms and instruments. But it's not African music, more like a three-way car crash involving a London pop-reggae band, M.I.A., at least one John from They Might Be Giants, and a kora player who was innocently trying to cross the street. The kora player in question is one Surahata Susso, who contributes some lovely riffs to "The Race," perhaps the most charming song about conception I've ever heard. The three core members of this London-based quartet (I know, but somehow this odd math makes sense with these guys...) are Max Baillie, Andre Marmot, and Nicci Simpson. The whole 7-song EP exudes a buoyant innocence that belies The Worm's growing reputation as a festival/party band. 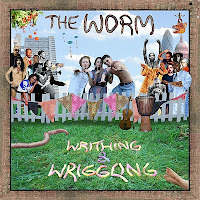 Billed as "Afro-reggae-garage," The Worm might be better described as grown-up-kids music you can dance to. And you will.